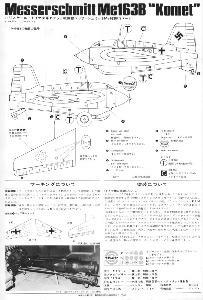 Two variations of the box art of the Hasegawa 1/32 kit. From the 1980 catalog, another picture of the completed kit. 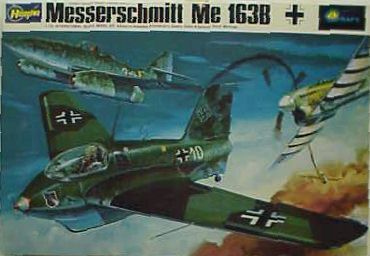 It shows the Me 163B-0 '54', a US captured Komet that is shown in a number of pictures. 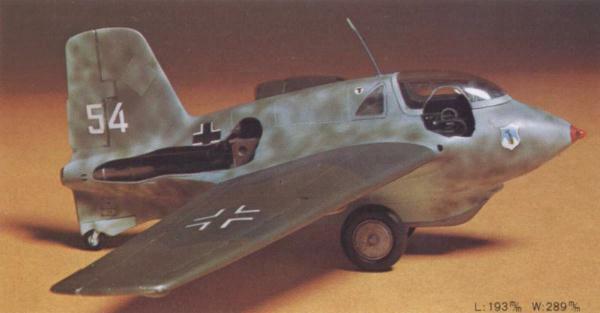 The posure of the model is not correct: the tail wheel spring looks completely deflated, as often occurs in museums. It's difficult to guess the colors: fusalage looks RLM76 with dark green mottling, but I don't know about the wing colors. I haven't read much on the quality of the plastic parts of this model. For the time being there is only one problem to report: the canopy has a small hole in the front. This hole is only seen on very few Komets, more specifically Komets that had a BSK 16 gun camera installed. Two examples are 'White 05' and 'White 14'. The hole is slightly offset to the right on the real thing, but centered on the model's canopy. 163107/'White 4' of 1./JG400. This is the strangest of the lot. 163107 looks like a bogus Werknummer; it does not fit in the known Werknummer ranges. 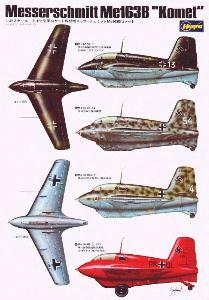 A code on the tail (instead of on the fuselage) usually designates a training aircraft, which makes 1./JG400 unlikely. Lastly, I have never seen a picture of this aircraft. I did find an old profile drawing depicting this aircraft in 'The pocket encyclopedia of world aircraft in colour - Fighter - Attack and training aircraft - 1939-1945' by Kenneth Munson, page 96. 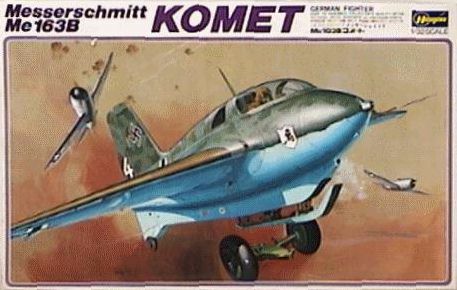 The caption says it is a Komet of '1./JG400, Zwischenahn, summer 1944'. 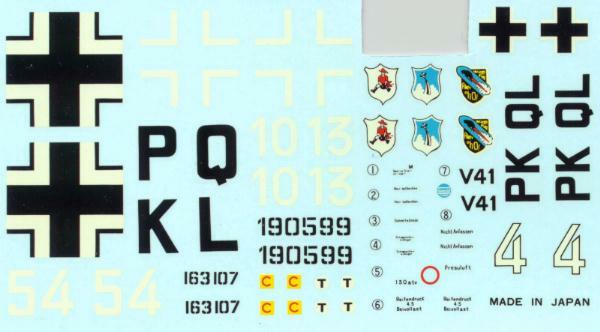 The Hasegawa decal sheet, kindly supplied by Claus Gustafsen from Danmark. In many European countries the Swastikas are cut out.